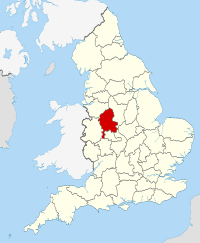 Staffordshire (/ˈstæfərdʃɪər/ or /[unsupported input]ˈstæfərdʃaɪər/; abbreviatit Staffs) is a landlockit coonty in the Wast Midlands region o England. Pairt o the National Forest lees athin its borders. It adjoins the ceremonial coonties o Cheshire (tae the north wast), Derbyshire (tae the east), Leicestershire (tae the east), Warwickshire (tae the sooth east), Wast Midlands (to the sooth), Worcestershire (tae the sooth), an Shropshire (tae the wast). The lairgest ceety in Staffordshire is Stoke-on-Trent, which is admeenistered separately frae the rest o the coonty as an independent unitary authority. Lichfield an aw haes ceety status, although this is a considerably smawer cathedral ceety. Major touns include Stafford (the coonty toun), Burton upon Trent, Cannock, Newcastle-under-Lyme an Tamworth. Wolverhampton an Walsall wur an aw in Staffordshire till local govrenment reorganisation in 1974, but are nou athin the Wast Midlands coonty. Apairt frae Stoke-on-Trent, Staffordshire is divided intae the destricts o Cannock Chase, East Staffordshire, Lichfield, Newcastle-under-Lyme, Sooth Staffordshire, Stafford, Staffordshire Moorlands, an Tamworth. For Eurostat purposes the county (less the unitary destrict of Stoke-on-Trent) is a NUTS 3 region (code UKG24). Together with Stoke-on-Trent and the authorities covering the ceremonial county of Shropshire, it comprises the "Shropshire and Staffordshire" NUTS 2 region.